The Ronald McDonald House in Providence (RMHP) serves the Rhode Island community by providing nearby lodging and meals for families of children who are patients at Women & Infants’, Hasbro Children’s and Rhode Island Hospitals. Its services are particularly valuable for families who travel a long distance from their homes, whose children are hospitalized for more than one night, and who would like to avoid the cost of staying at a local hotel during that hospitalization. Volunteer scheduling is a central activity of RMHP. Its purpose is to ensure that House operations and related activities are adequately supported. The previous system for managing the scheduling of over 200 volunteers was manual and paper-based. RMHP-Homebase was developed in Spring 2015 by a 4-student team at Whitman College. This software replaces the House’s manual scheduling system by an on-line system that is easy to use and learn. The software has been deployed and is in full use, allowing the organization to focus more fully on client service. 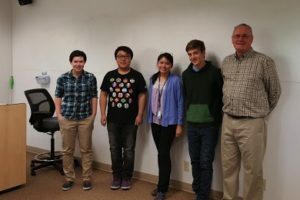 This project is a great example of how open source software developed by one student team for one non-profit can be reused by a different student team to develop a similar tool for a different non-profit. In this case, the 2013 version of Homebase software developed for the Ronald McDonald House in Portland, Maine was used by a different team in 2015 as a starting point for developing a strongly related application. Do you represent a non-profit that could also use a volunteer scheduling system? Contact us to discuss your needs! The Client: Ronald McDonald House, Providence, RI required a Web-based system to support volunteer and activity scheduling that would replace an obsolescent paper-based system. The Student Team: Whitman College, Walla Walla, WA supported the development of RMHP-Homebase by 4 students and an instructor during the Spring 2015 semester. The Software Professional: This software was deployed by the instructor and is hosted by Course Vector LLC, who also hosts the House’s Web site. Bug fixes and feature enhancements are provided by NPFI.